this luxury service is like a spa experience for the hair and scalp. we use our exclusive Pramasana scalp products to bring your scalp back into balance with deeply relaxing massage movements and our therapeutic, soothing scalp masque. your hair will be deeply conditioned with our exclusive botanical hair therapy that uses plant micro technology to penetrate your strands and replenish moisture, and help repair desert dry locks. this service is completed with a blowout and style. Starts with our restorative moisture or repair hair treatment that deeply penetrates strands to create luminous shine and healthier looking hair. our exclusive Pramasana scalp treatment is designed to purify, soothe, and restore balance to the scalp, paired with healing massage movements using our specialized massage brush, followed by our cooling scalp masque, this service is completed with a protective scalp concentrate and a relaxing blowout style. our skincare services are customized to suit a variety of skin types and needs, experience our deeply relaxing and rejuvenating skin services, with visible results. tulasara is the sanskrit word for "moving towards balance." 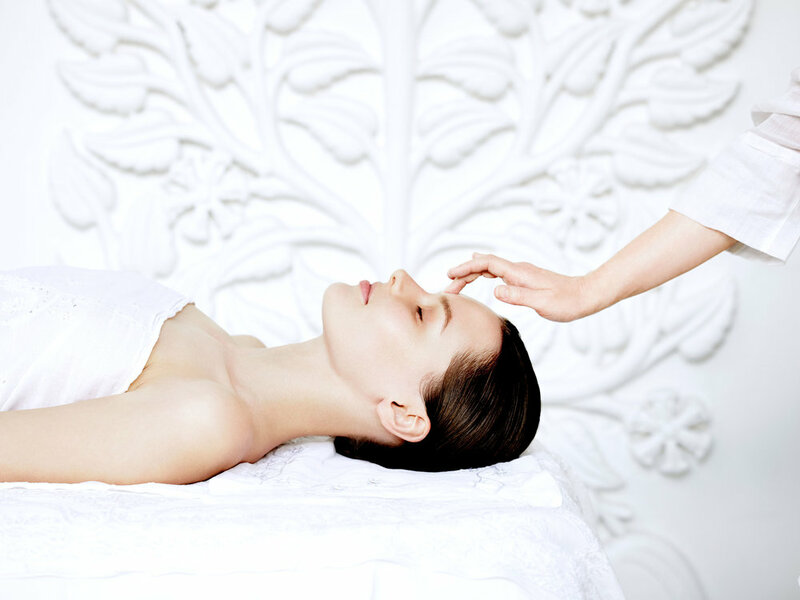 and all of our facial services are custom designed to bring your skin back into balance. experience luxurious, organic products in a facial that is customized to balance your skin's individual needs. enjoy therapeutic massage movements and our organic essential oils as your skin is soothed, cleansed, and nourished. aveda manicures and pedicures are treatments designed to care for the hands and feet while specifically addressing, dry, aging skin, rough cuticles, and overall nail health. our therapists will consult with you and help you to determine the services, and body care products that best meet your needs. our polish is vegan, and fortified with b5 and calcium, so your nails are left in better condition than before. our polish system dries like a gel in 5 minutes, with no UV light. this polish also removes quickly and easily, with no need for soaking. PLEASE NOTE: these services are only available at our location on West Flamingo and Grand Canyon. our custom treatments take your hands and feet to another level of smoothness, softness and hydration. coupled with our customized aromas, scrubs and therapeutic massage movements using aveda's own body care products, you will be left deeply relaxed and nourished. stress, muscle tension and lack of energy can be addressed with a customized massage treatment. your therapist will customize a massage service with personalized aromas and massage techniques to based upon the your individual needs and requests. your customized massage treatment can include swedish, deep tissue, foot reflexology, acupressure, chakra techniques, subtle energy work, pregnancy massage, or hot stone. PLEASE NOTE: these services are currently only available at our location on West Flamingo and Grand Canyon.